It's no secret that forget-me-nots are popular, as they are one of the most beautiful and stunningly blue flowers in the blue-flower world! Additionally, the name evokes emotion. 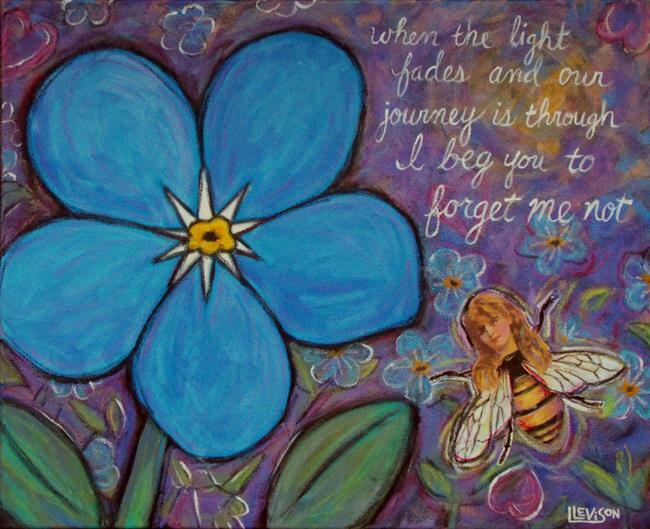 When it came time for me to create a piece for EBSQ's May 2015 exhibit "Naturally Blue Flowers", it wasn't difficult to settle on the forget-me-not. Then what? Well... it happened next that the text for this piece just popped out of me, and I wasn't even sure what it meant at first. But after creating the work around those words, I realized it's about love and souls and possibility and the afterlife... It's about being open to the idea that we can seek out, find, and reconnect with those we love after this life is over.